Ask The Bellwether: How do you ply on a charkha? How do you ply on a charkha? Given that I need 2-ply, 3-ply, and novelty yarns that are charkha-spun for the county fair, I had to look past that rule-of-thumb, "you don't ply on charkhas" and sort out how. First, since my hand is so used to turning clockwise, I chose to twist the band around the spindle in the other direction so although I'm turning the drive wheel clockwise, the spindle is turning counter-clockwise. Normally the band comes from the top of the spindle to the edge of the accelerator wheel that is further away from me, and goes around clockwise to return to the lower side of the spindle from the closer side of the wheel. Instead, I twisted it to come to the side of the accelerator wheel closer to me, it then go around the accelerator wheel counter-clockwise, and return to the lower side of the spindle from the further side of the wheel. Second, as my singles' spindles were too full to use the on-board bobbin storage as a kate, I had to hunt around. I started looking for a shoebox, but the first one I found was wider than the spindles. Then I thought about using the bread basket, but it's round and I needed to "kate" three spindles. Finally, I found the metal-mesh file holder I keep paperwork in.the paperwork is on the floor of my office, and the mesh container is now my impromptu charka kate. One piece of advice...I started plying and had that a-ha moment where things I tell students come back at me. These are fine, high-twist singles: the best thing I could do is let them sit for a few days before plying. Yikes! So after a rocky start and a day's rest, I am back to finishing them. Sure enough, the sleeping twist is much easier to deal with than the fresh twist! I've developed a bit of a rhythm with the plying, where I draw out an arm's length of the three singles, turn the charkha wheel twice, then wind the new yarn onto the spindle. It's getting quite full..,already the size of a small pear. One thing I might improve for my next plying stint on the charkha will be to sand the end of the spindle round. The sharp point (and it is s.h.a.r.p!) tends to split the plies and mess up the plying tension. By the way, did you notice the charkha? No, it's not from Ikea, despite its Scandinavian maple looks. It's the improved charkha from etradinglines.com (ecomtrader_in1 on eBay). They've finished all the wood and coated all the metal so it won't rust and doesn't need oil; replaced the drive bands with o-rings, and self-lubricated the spindle holder so cornhusk bearings aren't needed. The kickstand isn't on mine, and the bar for sitting on is replaced by a nonskid mat. This new model is pretty nifty, a nice step in quality and price ($169+ship) between the bare-bones Indian book charkha ($99+ship) and the top-of-the-line Bosworth book charkha ($445+ship). If your county fair has a charkha category and you don't have a charkha, see my post about turning your spinning wheel into a quill wheel: Should I Get the Quill Head for my Spinning Wheel? 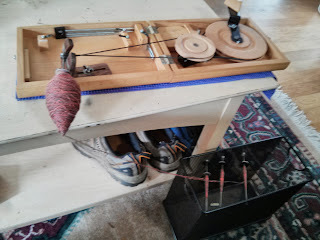 or check out instructions for making a cigar box charkha on spinningdaily.com. So, county fair entry number two: charka-spun, three-ply yarn. Cotton, too. The judge should appreciate this entry, it'll be the first charkha entry in several years, possibly the first cotton entry too. Only twenty-two more to go! Nice! Both the yarn and the charkha. :) I need to pull my charkha back out again.